Swedish office furniture is often discarded before the end of its technical lifetime when repairs are needed, businesses relocate or redecorate. The sector’s impact on the environment – 150,000 tons of CO2 equivalents a year – could be substantially reduced by moving to a circular model where furniture is renovated, repaired and sold again. Innovation: Working with 25 partners, EARTO member RISE created and piloted innovative business models for circular office furniture flows. Funded by Swedish innovation agency Vinnova, their work aimed to stimulate interest and spread knowledge, lower barriers to entry and gain acceptance of a ‘use and reuse’ approach. The collaboration also focused on making the loops in the new circular system as short as possible to increase its environmental, economic and social sustainability. Impact expected: The new models have shown a potential 50% reduction in raw material use and a 30% reduction in CO2 equivalents. 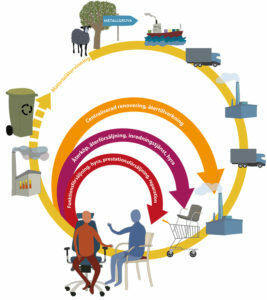 The project has also showed that the profitability of those who circulate tends to be higher than those who do not.There is now a common vision for the industry and its role in Europe as an exemplar of large-scale transition to the circular economy. There is also a five-year ambition for 80% of manufacturers to have circular alternatives and to extend the models to more sectors. RISE Research Institutes of Sweden, is an independent state research institute and innovation partner. In international collaboration with companies, academia and the public sector, RISE contribute to a competitive business community and a sustainable society.